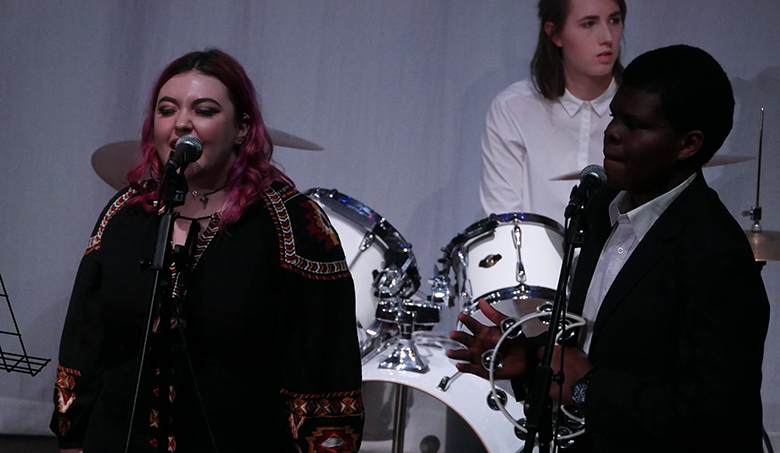 Music students at The Sixth Form College, Solihull celebrated the end of the Spring term and the forthcoming Easter holidays by entertaining friends, family and staff with an Easter Music Concert this week. A level Music students performed solos and demonstrated how complex the pieces of music they have been perfecting for their assessments are. This included solos on the piano, violin, flute, viola, classical guitar, trumpet and electric guitar. The College Soul Band performed and was a big hit as always, as they gave their versions of hits from Katrina and the Waves, Chuck Berry and Bruno Mars, while the Jazz Band performed some Dizzy Gillespie. Music Technology students were also involved behind the scenes, managing the live sound for the concert. Staff and students came together in the College Choir, including some ex-students who returned for the event. This included a guest appearance from ex-student Lily Allen-Dodd, a talented singer now studying at the Birmingham Conservatoire. Their performance included music from ‘Les Misérables’ and ‘Schindler’s List’. More photos of the Easter Concert are available on our Facebook page. Videos are also available on YouTube of the College Choir and the Soul Band.